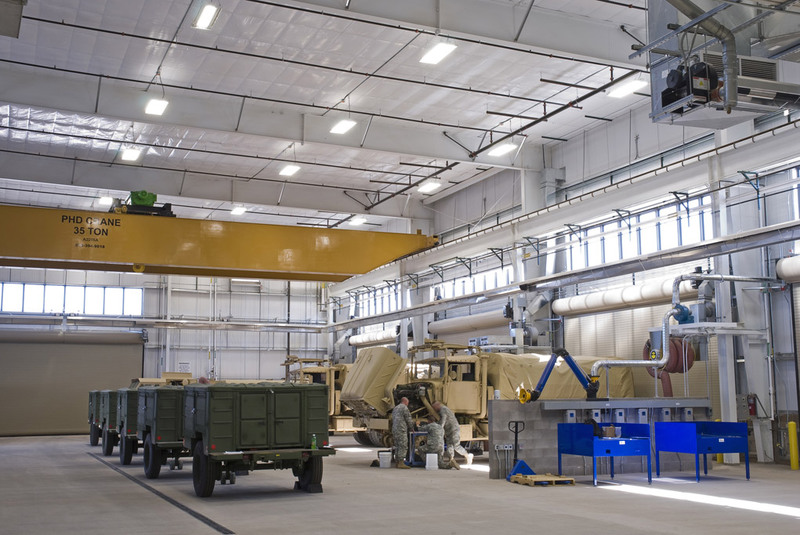 Benham provided full A/E design as part of the Design-Build team for this multi-building project for BCT3’s tracked and wheeled combat vehicles. 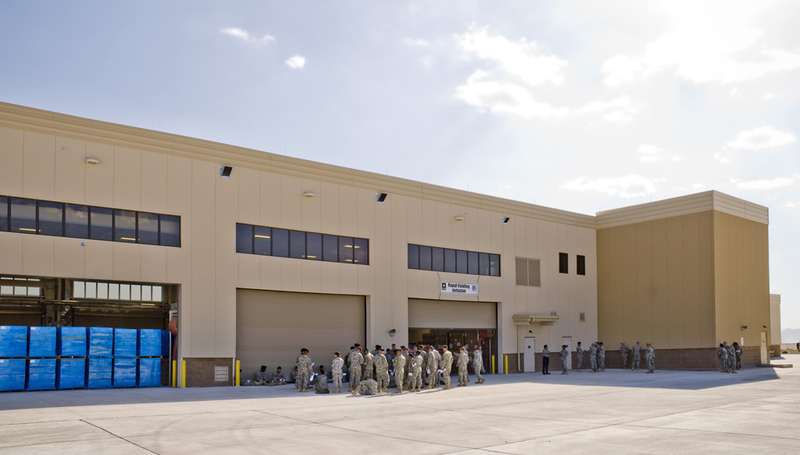 The buildings, each designed to support an individual battalion’s vehicles, range in size from 34,297 SF to 55,490 SF. 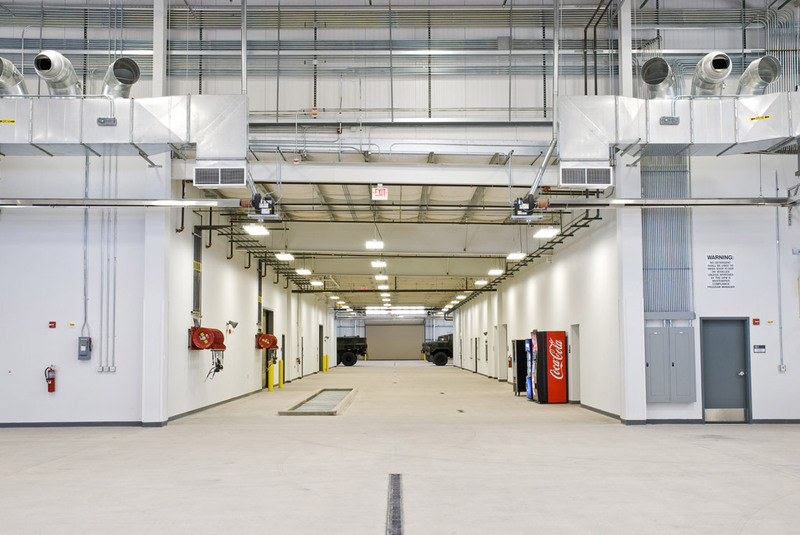 The facilities were designed with a target of LEED® – Silver as a requirement of the RFP. Checklists and supporting documentation were prepared and provided by LEED accredited professionals. Benham worked closely with the Design-Build contractor to assure that credits accounted for were planned for and thought out in advance of the design and construction phases of work which included coordination between the plans and specifications. • Design Management, Architecture, Interiors, MEP Engineering, Fire Protection, Communications, Security. • Site engineering to include geotechnical report. • Acquired all local, state and federal permits. • Architecture and interior design to include building exterior and interior, signage, and a comprehensive furniture package. • Design of telecommunications systems and service. • Design of Security Systems: CCTV, IDS, PA, Mass Notification. • Design of MEP and Fire protection systems design. • Energy model analysis IAW LEED, and EPACT 2005. • Life Cycle Cost Analysis of selected mechanical systems. • Design IAW UFC 4-010-01, DoD Minimum Antiterrorism Standards for Buildings. • Sustainable design solutions to meet a minimum LEED - Silver rating. • Construction Phase Services: RFI, shop drawings and submittal reviews, construction observation, on-site Resident Engineer during construction. LEED is a registered trademark of the U.S. Green Building Council (USGBC) in the U.S. and/or other countries.